Australian Image wrote: My audio is now excellent, through just a Rode VideoMicro. Some morning tests today picked up even faint bird songs in the distance. I detailed this in a previous post, but received no interest. I thought that asking questions was showing interest. I quoted it before for you Leon. Wayne Steven wrote: I quoted it before for you Leon. Thanks Wayne. I appreciate that. I must have been on Mars with my buddy Matt Damon when Ray informed us that he had received the part he was waiting for. Are all Australians bad tempered or just the ones that purchase BMD products? Don't know, but find a lot of bad tempered non Australians on cinema forums. I tend to find low end people a bit moodier around here and higher end people more wonderful on forums, but then again, non left wing Australians tend to not suffer foolishness gladly (except themselves). So, repeatedly asking about something posted and pointed out might fall in that category with them It doesn't really affect me that much, just a misunderstanding unless it refuses to resolve. Certain Europeans are the worst as far as attitude, worse then certain Americans. Australians tend to let things fly more than I do (because I SEE), but rough necks are rough necks, which gets me into Australian builders. But still, I did require a logical leap to ascertain the reason why the video mic started working by itself, was because he inserted the part he had received previously to do it, between the camera and it. Still, good news. But BM should publish a microphone sticky with which mokrs work with it. Hmm, just a thought I want to do my own processor array, and BM does enough products to run an volume asic wafer program with a mixture of parts on the wafer, allowing them to custom asic all their cameras reducing cost, size and heat. I could hitch a ride. They can do this where it is maybe more expensive for Red (though they may have arrangements with their sensor provider) because BM produces a range of products making their volumes much higher). Maybe I should talk with them in the future my designs would outdo most anything they are using. Got to dig up that asic chip making software out they used for industry leading low energy solutions. I just tried out the stereo videomic X with the pocket 4K's 3.5mm jack. With the mic seto to +20db mode, levels barely showed when I clapped right in front of the mic. Also, the pocket 4k's mic gain is grayed out when I have inputs set to 3.5mm. Is this normal? Benjamin de Menil wrote: I just tried out the stereo videomic X with the pocket 4K's 3.5mm jack. With the mic seto to +20db mode, levels barely showed when I clapped right in front of the mic. The 3.5mm inputs can be set to line level or mic level. But the mic level option is not available in the menu if one of the channels is set to 3.5mm line. So before setting the first side to 3.5mm mic, make sure the other side isn't set to one of the 3.5mm line options. The reverse is true for discovering line level options if you have a side set to mic level. With 3.5mm inputs set to mic level I got plenty of gain with rode videomic X. I'm not experiencing the level issues others on this forum have reported. Maybe my unit is from a later batch. But I haven't had a chance to check the quality of the audio - I'm just going by what I see on the levels, which is plenty of gain to spare. Benjamin de Menil wrote: I just tried out the stereo videomic X with the pocket 4K's 3.5mm jack. With the mic seto to +20db mode ... I'm not experiencing the level issues others on this forum have reported. From your description, you're experiencing exactly the same levels reported here. The difference is, the mic's amplifier is adding 20db to the signal. Set it to zero added gain, and see what happens. I just had to lower it to zero because I had too much gain, even with the pocket's gain at 50%. It looked like with gain set to 50% I was clipping the Pocket 4K's pres or AD at about -6dB. That would mean that at 50% gain it's not possible to get to 0dB. Could also be the Rode mic was saturating. Anyway, was fine once I set the mic to flat gain. I was recording a concert, drums and amplified instruments. I'll see how it fairs tomorrow with conversational level volumes. Generally speaking, I'd always get as much gain out of the mic as possible, because I figure the mic's gain is better than the camera's. With Rode video mics, it doesn't seem to me that my version of the Pocket has a problem. Does it mean the issue is solved, and it was just a matter of the correct setting? No. He had some user error to contend with. It sounds like his mic is "hot" to begin with (and may have additional amplification even at zero), and he was recording loud electric instruments and drums. Too many unknowns here to conclude much of anything. Benjamin de Menil wrote: The 3.5mm inputs can be set to line level or mic level. But the mic level option is not available in the menu if one of the channels is set to 3.5mm line. So before setting the first side to 3.5mm mic, make sure the other side isn't set to one of the 3.5mm line options. The reverse is true for discovering line level options if you have a side set to mic level. That's weird and unexpected. I hope BM considers this a bug. I would expect 3.5mm Line and Mic should be selectable no matter what the other channel is set to. Gene Kochanowsky wrote: That's weird and unexpected. I hope BM considers this a bug. I would expect 3.5mm Line and Mic should be selectable no matter what the other channel is set to. There's only one 3.5mm jack (with right/left channels), so how could you have line and mic levels at the same time? It's one or the other, for both channels. I agree, however on my camera I do not see selections for both 3.5mm line and mic unless the other channel is set to an input other than 3.5mm. Looks like a bug. Otherwise if both channels are set to 3.5mm line then mic is not selectable on either channel and visa versa. Last edited by Gene Kochanowsky on Wed Dec 05, 2018 2:55 am, edited 1 time in total. The Ursa Mini Pro OS, which the Pocket 4K is using, has two audio channels that are independent of each other and each channel can be individually selected (think stereo left/right) between the two audio input sources, XLR and XLR AES. Where the Original Pocket and Micro only has one audio source connection the 3.5 stereo inlut, so both channels were selected together from mic to line. 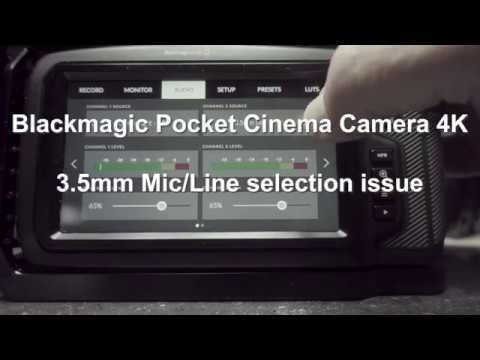 My guess, looking at the manual, the new Pocket 4K has a XLR inlut and two channel 3.5mm input. So the OS is Since the two are locked to gather on the 3.5 connection, both sides/channels need to be switched from mic to line, so you need to switch channel 1 and channel 2. In theory, you could select one channel from the 3.5 and the other channel from the XLR. This would make sense, if using a lav wireless set to mono for one channel on the 3.5 Mic inlut and the other channel set to XLR Mic. for a shotgun or hand held mic. like in an interview situation. When this issue is described in text there seems to be some problems in understanding the issue, so for that instance I've made this little video. A Pix is word, and Yes, I see now what yiu are talking about, thanks for the video. This is not how the UM Pro/Broadcast audio menu works. Each audio channel is independent of the other, and one side can be mic, while the other side is line or AES. So this indeed does seem to be either a design error or a bug in the OS. Unlike URSA Mini Pro, the stereo 3.5mm inputs can either only be line or mic, hence when mic level is selected for one side, the other has to be the same which is why line is not available. I can see why this could be confusing and the interface wi be tweaked to better communicate that the other option is not available. Thanks Kristan. I think people probably would like a 3 to 5 line 3.5mm jack in the future, where each line could he independently set to anything, if BM is listening? Can hook up some surround that way. BTW, when's the next camera announcement? (Have to try, CES, new micro?). Kristian Lam wrote: Unlike URSA Mini Pro, the stereo 3.5mm inputs can either only be line or mic, hence when mic level is selected for one side, the other has to be the same which is why line is not available. A possible way to restrict selection for the PC4K is not to restrict line/mic selection for 3.5mm inputs but when a given channel is changed from line or mic to the opposite value, if the other channel is set to a 3.5mm input it is automatically changed to the corresponding line or mic value. That might be surprising to the user but I think they will quickly understand how it works and not jump to the conclusion that their camera is broken because it appears to be always stuck in line or mic mode and when they plug in a mic or line source their audio levels are way too low or high. Good idea Gene, having both sides of the 3.5mm input set together, would reduce the confusion. Bad tempered? I'm trying to be informative and pass on what I've discovered, but the posts that actually describe the details appear to elicit little interest. So what gets post in this long thread will become buried in short order. However, my solution appears to be working quite well, but I'm yet to go through my video taken during a week in the bush. I might have to do a complete writeup on this issue, as I do appear to be making some headway which might give others ideas. That would be very interesting. Looking forward to it. As best I understand it, you're amplifying the signal and using another device in the middle to power the mic. That's fine, but it's not a "solution". It won't help anyone who wants to to plug directly into the camera and record audio, but can't because the levels are much too low. The idea is to get the mic input working without additional equipment, at least for occasional use or convenience. Not so. The solution that I've come up with is working very well, with recording levels in the camera now quite decent. But I'm still looking for a better way to power the mic. The latest option that I tried didn't work, so I'm searching once again. I could have found an easier solution, but I want something that's not overly bulky and fiddly to set up. I'm sure that everyone would be interested in a solution that's portable and usable even when the camera is not on a rig. It's always been understood that by raising the level of the signal, using a mixer or similar device, you could record. That's never been in doubt. I'm glad that it's working for you, but what you're reporting doesn't answer the question being asked: what's going on with the camera's preamps? In my own nonscientific testing the same mic plugged into the 3.5mm and the xlr is exactly 12db louder on the xlr and it sounds fuller and better on the xlr. That being said, the xlr is still more quiet than I would like. I recently did an interview and had to set the gain to 100% using a professional sony clip on lapel using phantom power. A co-woker used the same setup with the same interviewee and his gain was set much lower on his sony ENG camera to achieve the same level. It works as is, but for sure it's lower level than other cameras. It was a crude comparison, but I couldn't equal the levels of the onboard mics even after adding 30db to the 3.5mm Sony mic recording in Resolve, with both at 50% gain in camera. I think the issue of what the camera is doing is a Blackmagic problem awaiting a solution, if that can be achieved. The user issue is how to make do in the interim, especially with small and simple solutions. There are plenty of bulky and expensive solutions available, but they are kind of crazy given the size and price of the camera. Ray, at the risk of the Aussie thunder raining down on me you keep mentioning how your solution works but I do not remember if you have ever described your solution aside from saying that you are waiting for a part to arrive. If I have missed that post please forgive me, but what is your solution? I am interested in knowing how you have gotten power to the Rode VideoMicro. I've now tested at regular conversation and there seems to be plenty of level using the rode stereo video mic x set to zero gain. It's true that it's a hot mic. Not sure what the situation might be for a passive dynamic mic for instance. at various different gain settings, I've noticed clipping on the VU well below 0dB. I haven't listened to what it sounds like yet, but it looks to me like digital clipping - it very abrupt. If so, there are some issues with the pocket 4K's firmware. Digital clipping should not occur at less than 0 dB. Leon Benzakein wrote: Ray, at the risk of the Aussie thunder raining down on me you keep mentioning how your solution works but I do not remember if you have ever described your solution aside from saying that you are waiting for a part to arrive. I have previously stated that I use an Olympus LS-14 to provide power to my Rode VideoMicro, that's the first hurdle. I'm looking for a simpler solution to the LS-14. If you use a powered mic, then you don't have that issue. To boost the signal I use a Cayin C5 headphones amplifier from the LS-14 to the camera. This provides all the needed boost to allow the camera to record even the lowest level sounds. There are many alternatives to the Cayin C5. Alternatively, you can get any number of devices that perform all of this in one unit, but none are small or inexpensive. I've posted much of what I've done here: https://australianimage.com.au/blackmag ... a-4k-pt-4/ and will post another story specifically on the audio issue at a later date, as I search for an alternative to the LS-14. I'm assuming that anyone doing any kind of professional work has a few preamp/dedicated recorder options as well as mic options. None of that addresses the question of the thread - "weak preamps?" The answer to that, for anyone recording direct to the P4K is - Yes, relatively speaking. Using the basic audio principle of feeding a strong signal to any gain stage (to minimize the inherent self noise that virtually any gain stage will add) is predicated on the idea that you can then use low gain at the recorder. Even on the mini XLR we have to run the input gain high. That said, the pres on the XLR stage are clean enough and so far cranking up the input to around 70% still results in a solid sound. I haven't tried anything into the 3.5 but I'd like the option in challenging situations. Mainly, because of it's design, small form factor - it's pretty important that it doesn't need to be rigged with anything in order to capture good audio. We do most work with sparate audio but I really like the opportunity to record direct for a lot of other work and, at least with the XLR/phantom power setup with a simple ME-64, it does sound good - if a bit underpowered. It does seem odd that the camera can't effectively use external mics without any sort of assistance. But that's the way it appears to be, so workarounds are the only option. I'm sure that Blackmagic is well aware of the complaints and there's not a jot that any user can do to change what's built into the camera. Flogging a dead horse isn't going to achieve anything. Although it's a workaround and not a solution, a Tascam DR-60d Mkii or DR-70D recorder can output a 3.5mm line level stereo signal from it's preamps to the mic input of the BMPCC 4K. For the DR-60D Mkii this is a 200 ohm signal with an output level of -10dBV to +10dBV. The DR-60D Mkii also has a 3.5mm camera low mic output at 200 ohms that has a separate volume control for a level of -50 dBV to -30 dBV. These units have 1/4-20 screws that bolt to the bottom of the camera and fit between it and a tripod. They have mixers and can be set to monitor the audio coming out of the camera and mixing it into a stereo mix on it's SD card or as a separate stereo file plus the stereo file of mics connected to the Tascam. A manually operated or automatically operated slate tone is provided to sync the SD card's files with the scratch tracks of the camera's video files in post. The class A discrete circuit preamps provide a generous 65 dB of gain and use up alkaline batteries in 2.5 - 4.5 hours, but they can be powered externally through the USB port (something you can't do with a Zoom H4N). There is also a Tascam DR-701D with more features including a time clock input. I've looked at the Tascams and similar, but all of them are excessively large. I've asked Curtis Judd whether he could shed some light on whether there are any 'small' units available that could power a non-powered mic (such as the Aputure A.lav module). I believe that he has, or has access to, a BMPCC4K and might have some suggestions down the track. I could easily solve the mic power issue if I bought a powered mic, but I kind of like my Rode VideoMicro. It's not only small, but a very good mic for what I need. While I agree that Blackmagic Design is aware of this, between the posts from BMD reps here, I still don't think we've seen anything that resembles a "yes, we've been able to replicate the issue and we are seeing the same thing—we're looking into it". Companies often don't publicly admit to issues because it could cause a rush of complaints of false advertising, returns etc. If the issue is fixable via a firmware update, then it'll simply come in a future firmware update. I'm just wondering whether Blackmagic focussed on the in-board audio, which works quite well, and assumed that users would be using audio boosters etc when using external speakers and using these on a rig. The BMPCC4K was, after all, supposed to be a cine camera usable without any additional accessories, which it is. Also just bought a cheap saramonic - I think 'm3' - as an alternative to the rode videomicro (which has very low levels.) Haven't pushed the sound quality yet, but the level isn't bad for fx at about 70%, with its +10db boost. (It's battery powered, for what that's worth.) It's small, and fits in my bag, so I'm hoping it will be ok for basic fx. I was thinking of trying something similar with an Aputure a.lav module into a Fiio A1 amp, which would be a pretty compact workaround. However I'm not sure if the A.lav provides regular plug-in-power or something proprietary for the specific mic it comes with - does anyone have one to test? I have the usual Zoom and Tascam recorders that can provide clean signals but I agree there must be smaller solutions for when a recorder isn't practical. I ordered the Aputure A.lav a week ago in the hope that the power module will work. I should receive it soon, so will report on whether it works or not. After getting an RMA replacement from my first BMPCC 4K due to a defective XLR port, I've been testing out the XLR jack on the replacement. My first camera just produced electronic noise from the XLR jack when using phantom power and I noticed that the noise was much worse when the camera was drawing AC power vs. battery power. It led me to wonder if all the components on the port side of the camera we're truly shielded. The results of my tests with the new camera suggest a possible correlation between between audio noise and power draw. With a Sennheiser MKE 600 drawing phantom power from the XLR input and a Samsung T5 1TB drive attached, the camera records electronic noise that becomes pretty intolerable if the preamp gain is at 70% or above (roughly -40db noise floor in a otherwise silent room at 70% gain). This occurs when the camera is powered by battery and the culprit seems more to be the SSD's power draw. I reached this conclusion as electronic noise is still there - albeit much fainter - even when using the internal mics with the SSD attached. With no SSD attached, I don't hear the noise whether recording with the internal mics or with the Sennheiser drawing phantom power. Conversely, when connected to AC power, the noise goes away completely BUT additional tests lead me to believe there's still unnecessary noise in the audio signal. The Sennheiser MKE600 can be battery powered and when powered as such vs. by phantom power, there's much less audio noise. I'm familiar with phantom power adding a bit of noise but the benefit should be more sensitivity... a better SNR (signal to noise ratio). This does not appear to be the case as the recorded audio (not the noise) is no louder when the MKE600 is phantom powered vs battery powered. 1) the LP-E6 battery does not have sufficient power to drive the preamp, phantom power, and SSD drive optimally at the same time. An external battery solution should hopefully be able to address this. 2) Some external noise may be affecting the audio signal when using phantom power since there no noticeable SNR improvement. The best solution for me is to battery power the MKE600. The signal appears strong enough and quiet enough when the camera preamps are cranked up. I will need to carry AA batteries but on the plus side the BMPCC 4K battery won't drain as fast. I'd be very interested if anyone can confirm similar findings to ensure my subjective results aren't just a corner case. Hope this was useful info. Al Slamecka wrote: I'd be very interested if anyone can confirm similar findings to ensure my subjective results aren't just a corner case. I've got an NTG-2 which can be powered either by battery or phantom, and I've got a v-mount battery solution so I can test the various combinations. My office is too noisy on a weekday, though I might try tomorrow. I can report that the A.lav option doesn't work, so as a final attempt, I've ordered an inexpensive Saramonic SR-M3 powered shotgun mic to see if I can eliminate the LS-14. At least with this mic, I can connect another mic, like the VideoMicro, to the Saramonic and it will combine the audio from both. I'll also see whether this works without the Cayin C5. But I'll probably end up using the amplifier anyway, unless it causes audio issues, which it hasn't so far. Finally I can report some success. After several failures, I decided to buy an inexpensive Saramonic SR-M3 shotgun mic, to test out, and I can now confirm that it works, whether plugged directly into the camera or through my Cayin C5 amplifier. Over the next few days I'm going to run audio tests to see how well it can capture audio in open environments (field use), which will be my intended use. I could find no real tests of this microphone being used to capture natural sounds like I want to record, as all have been more or less for vlogging (indoors and outdoors). Australian Image wrote: Finally I can report some success. After several failures, I decided to buy an inexpensive Saramonic SR-M3 shotgun mic, to test out, and I can now confirm that it works, whether plugged directly into the camera or through my Cayin C5 amplifier. Has anyone tried the Azden SMX-30 (mono/stereo)? Also looking at the Deity V-mic d3 Pro (it has a dial for gain as opposed to fixed positions). There are quite a few reviews on YouTube regarding this mic as well as others in a similar price range. I could have picked any of them and they probably would have been very similar. The main reason I chose the Saramonic was that it did sound good from the reviews I watched, but the clincher was the fact that I could attach a second mic to the Saramonic and it would combine the audio into one. How well this will work remains to be seen. I can fully confirm now that a 3.5mm mic, powered or unpowered, on the BMPCC4k will not record any audio at decent sound levels without assistance. Using the Saramonic SR-M3 on it's own yields a very poor response, but with the Olympus LS-14 and Cayin C5 residing between the mic and camera, the audio levels are very good. The Saramonic performed much better than the Rode VideoMicro when it came to sound levels on a series of tests that I performed, so a powered mic aids significantly in audio response. I have no doubt that a quality powered mic like the Rode VideoMic/VideoMic+ would provide better quality than the Saramonic, but how much better given the cost I'm not sure. Unfortunately, all the video reviews that I can find are all about vlogging; no one seems to do any field recording with video cameras so I don;t know if there are any alternate solutions.